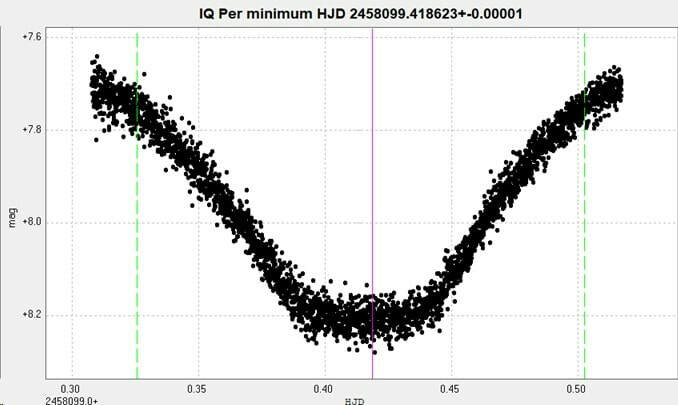 A primary minimum of the EA type eclipsing binary IQ Persei / IQ Per observed from Somerby Observatory. The light curve was constructed from photometry of 3392 unfiltered images taken with the 2" Titan. A primary minimum observed with the 2" Titan at Somerby Observatory on 2019 January 30, constructed from photometry of 818 unfiltered images. The images for this run were more defocussed that those of 2017 to improve the sampling, hence the reduction of scatter to the mean curve. 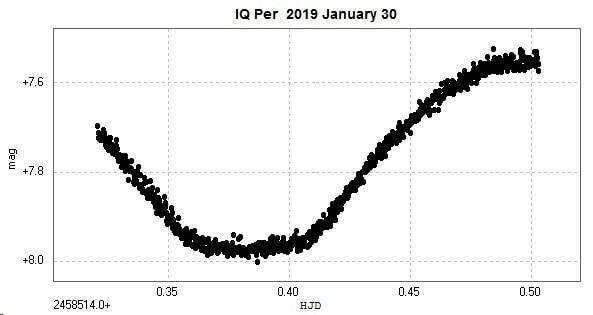 However, the deduced magnitudes are consequently affected by blending with a nearby star, (UCAC4 691-026144, V=9.3, approximately 40 arcseconds away) hence the higher value of the magnitude at minimum.